In Spring 1 we looked at living things and their habitats. We used this to help us classify objects as LIVING (do these things), DEAD (used to do these things) or NEVER ALIVE (could never do these things). We thought about what we would expect to find, what we actually found, and how the survey could be improved next time. Finally, we thought about food chains and how animals get their food. All food chains start with a producer (a plant), which is eaten by a consumer (an animal), which is often eaten by further consumers. Usually the first consumer is a herbivore (only eat plants) and the second consumer is a carnivore (only eats meats), but omnivores (eat anything - OmNomNomNivore) can be at any level too! Here are some games to play involving food chains! The Food Chain Game Can you order the plants and animals correctly? BBC Food Chains - Savannah Can you sort out this Savannah food chain? 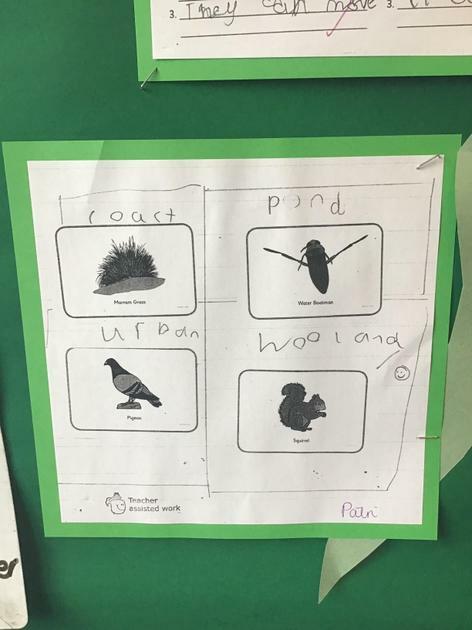 BBC Food Chains - woodland Can you sort out this Woodland food chain? RSPB Foodchains Can you work out the missing links?